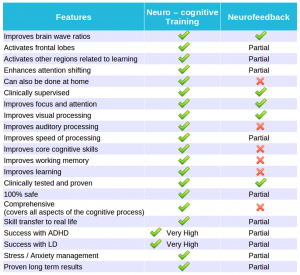 While neurofeedback is a very potent treatment modality, we find that many times it is not enough, Our extensive, patented, neuro-cognitive technology is a result of working with neurofeedback protocols for years and understanding it’s advantages and disadvantages. The following table expands more on the benefits. To read more on our program’s benefits click here.